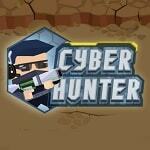 Cyborg in the game Cyber Hunter goes on a hunt against thousands of armed soldiers. The player has to improve the cyborg to the maximum by acquiring new weapons and improvements. Do not let yourself be defeated and avoid shots of enemies!